You guys, this has been such an incredible day! One of Brennen's dear friends (one of the 'Friday Friends' I talked about HERE), was granted a wish through the Children's Wish Foundation! I've watched Benjamin grow up, and have spent so much time with him and his family, so it was an absolute honour to be there today when he received such a special gift. 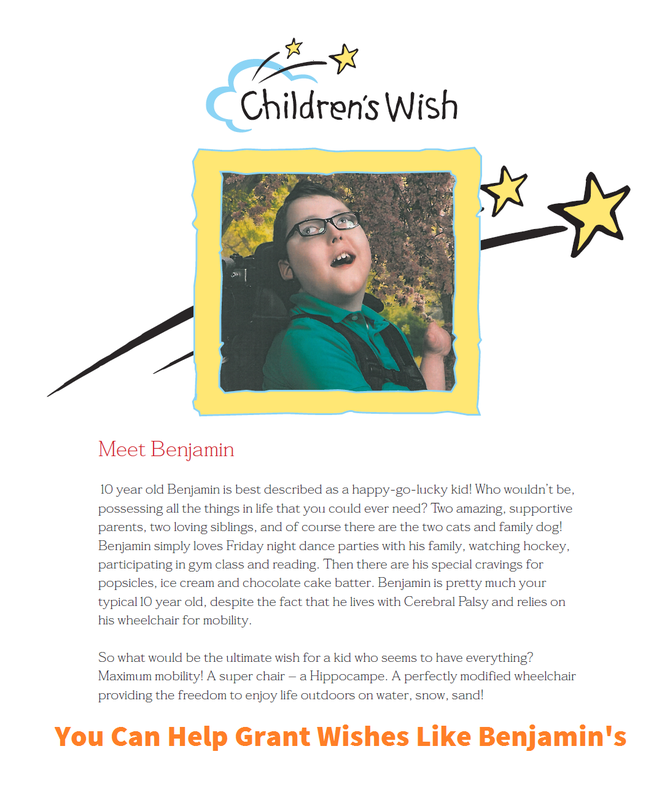 "Benjamin is an incredible 11 year old little boy. He has gone through so much in his life, and he deserves every bit of happiness that can be brought his way. He was born 15 weeks early (at 25 weeks gestation) and spent over 6 months in the NICU, just trying to survive each day. He had a very difficult first few months of life, and came home on oxygen and monitors to help him get stronger. He's had many stays in the Pediatric Intensive Care Unit, numerous surgeries, and he's had too many "close calls". Despite all of this, Benjamin has the biggest and most genuine smile. Benjamin is diagnosed with spastic quadriplegic cerebral palsy. He has chronic lung disease, he wears a cochlear implant, he has vision loss (but sees well with glasses,) and he has a seizure disorder that is controlled well with medication. He is g-tube fed, and he is nonverbal but vocal when he wants something or is excited! He has the best brother and sister who see him as a regular kid who just needs some extra assistance with things. He enjoys music, doing Legos, and watching hockey, Wipeout, America's Funniest Videos, and anything else that makes him laugh. He is a very happy boy!" 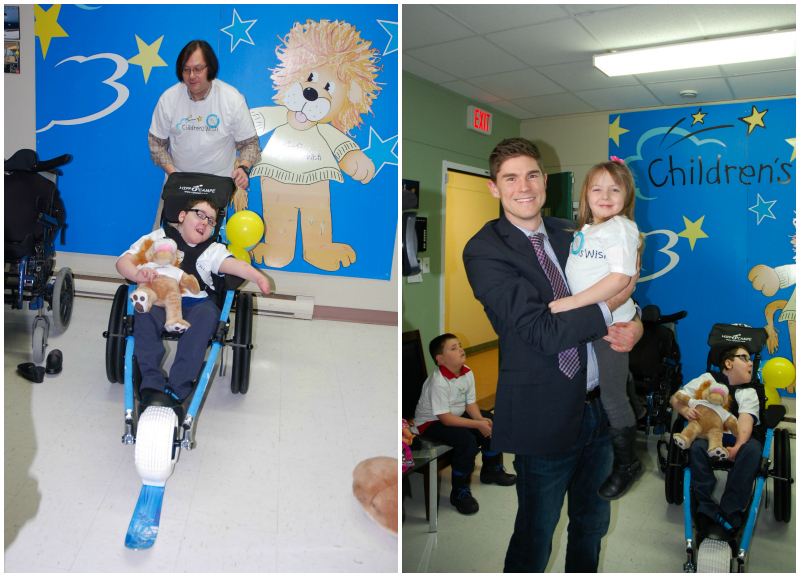 Today, Benjamin was granted a wish by The Children's Wish Foundation! 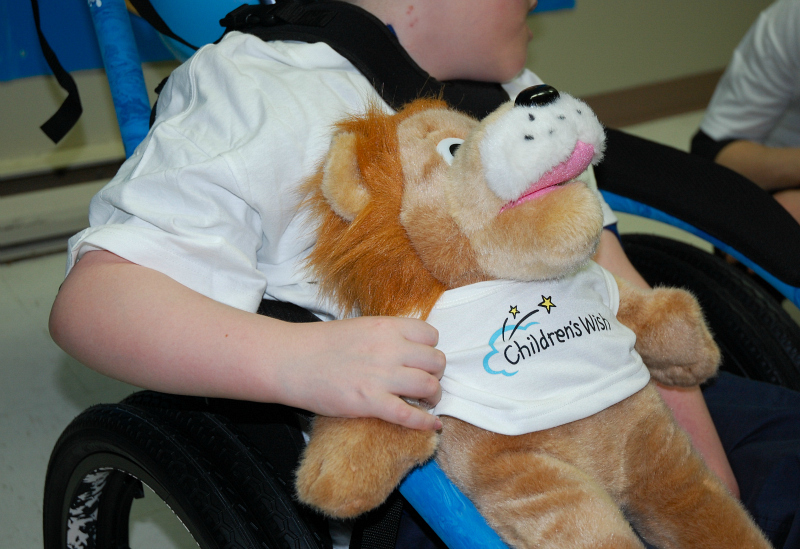 Lisa says, "We have chosen to get Benjamin a Hippocampe, which is a type of all-terrain wheelchair. It will allow us to take him on trails, in the snow, and on the sand - places that are pretty much impossible for him to go in his wheelchair." Wedgwood Insurance Limited raised money for the Children's Wish Foundation, and presented a cheque to Benjamin's family for $10,000 - the average cost of a wish. When the staff at Wedgwood found out how much the Hippocampe actually costs after all the accessories are added on (about $15,000), they said they'd write another check for the additional amount! How incredible is that?! Lisa added, "We are beyond thankful for their generosity. This will give us so much freedom to be able to take Benjamin places that he otherwise would not be able to go." Anyone who has tried to push a wheelchair through the sand (or the snow more often here in Newfoundland) knows that it is nearly impossible. This greatly limits the activities that someone in a wheelchair would be able to participate in, and the locations that they would be able to explore. A Hippocampe is an all-terrain wheelchair that enables everyone, of any age to enjoy outdoor activities to their full ability. Benjamin will now be able to explore sandy beaches, snowy trails, and off-road paths with his whole family, instead of having to either stay home, or take an easier route. The Hippocampe comes with all-terrain wheels, large beach wheels, and a ski attachment. 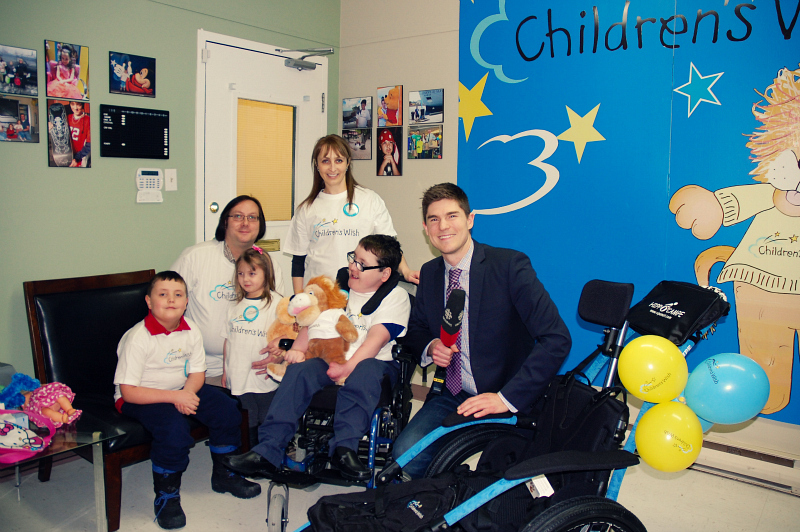 Benjamin, I can just imagine the fun you are going to have in your new all-terrain wheelchair! Help grant the wish of a child living with a life threatening illness or life-limiting disability today!